As of Friday morning, Ramos has been charged with five counts of first-degree murder, CNN reported. According to multiple reports, Ramos had been engaging in increasingly vicious harassment of the publication on social media in recent months. “He was prepared to shoot people. His intent was to cause harm,” Acting Anne Arundel County Police Chief William Krampf said at a press conference. The five victims have been identified as Rob Hiaasen, Gerald Fischman, Wendi Winters, Rebecca Smith and John McNamara – all of whom were employees at the paper. A GoFundMe campaign has been set up to help the victims and Capital Gazette staff. During Thursday’s shooting, an intern at the newspaper, Anthony Messenger, tweeted, “Active shooter 888 Bestgate please help us.” Messenger survived the attack. “Gunman shot through the glass door to the office and opened fire on multiple employees. Can’t say much more and don’t want to declare anyone dead, but it’s bad,” Davis added. Staff at a Maryland newspaper have published a Friday edition of their paper, in a show of defiance against the shooter who attempted to tear their organization apart in a savage act of violence. “We are putting out a damn paper tomorrow,” tweeted reporter Chase Cook. According to the BBC, a team of Gazette reporters worked out in the office parking garage to get Friday’s paper to print — their office was cordoned off as a crime scene. 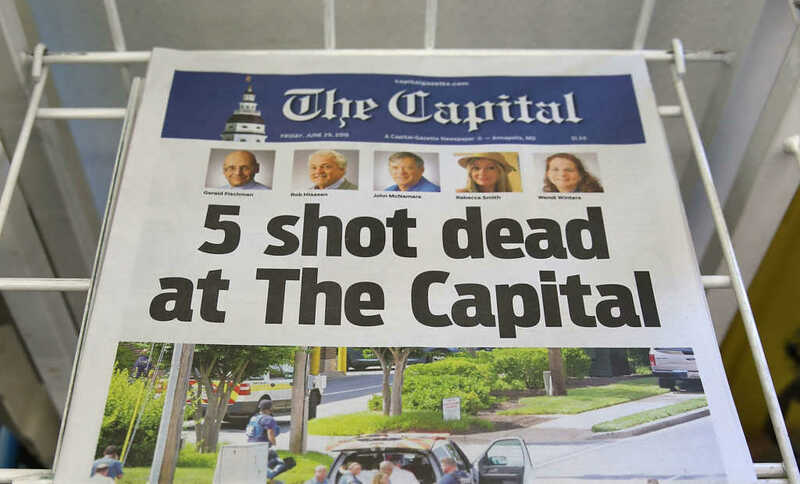 Please keep the men and women of The Capital Gazette in your prayers as they move forward following this tragic loss.